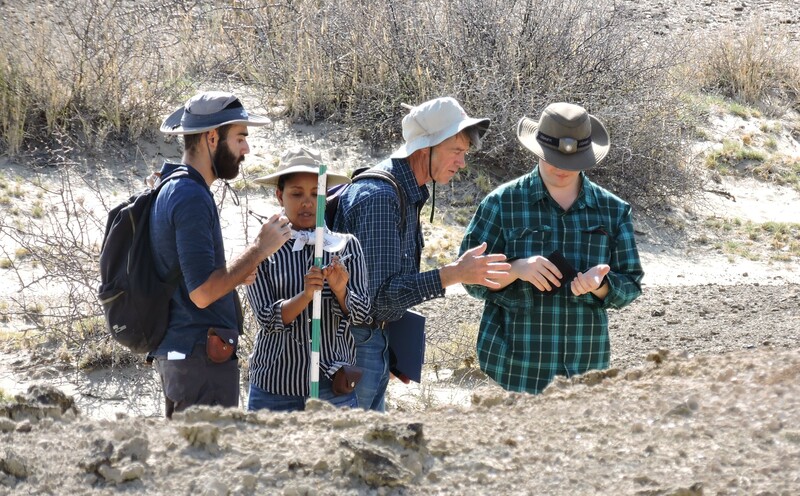 TBI students headed east along the Turkwell River, early last week, to map the stratigraphy of the Epim site: a series of lakebed and shoreline deposits that are less than 10,000 years old. Working diligently throughout the early morning hours, as shepherds passed bringing their goats to graze or feed at the river, students documented a part of the history of Lake Turkana and its changing geography in this region. 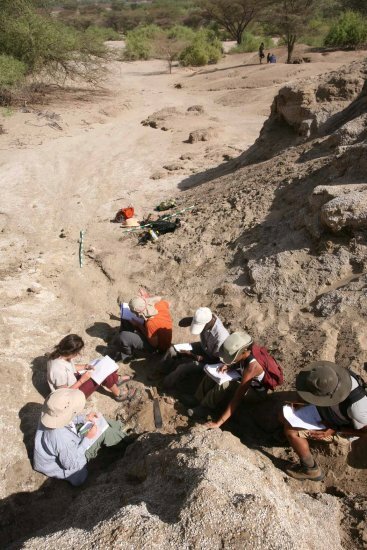 Epim is not well studied, and so student work contributes to the planning of future excavations. 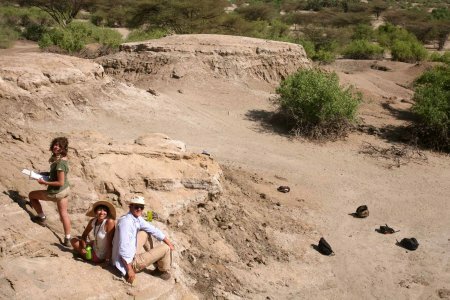 Meadow, Priscilla and Peter look up from their work documenting the stratigraphic sections at Epim. 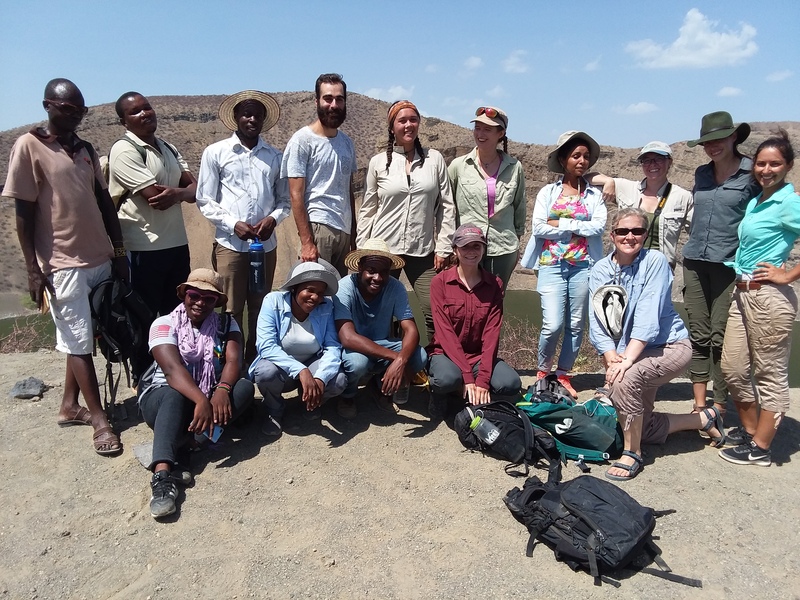 Turkana Basin Institute fieldschool students have recently returned from a 2 day visit to Lothagam, southeast of basecamp, the source of a famous hominin mandible discovery and one of the most important fossil bearing assemblages in East Africa. 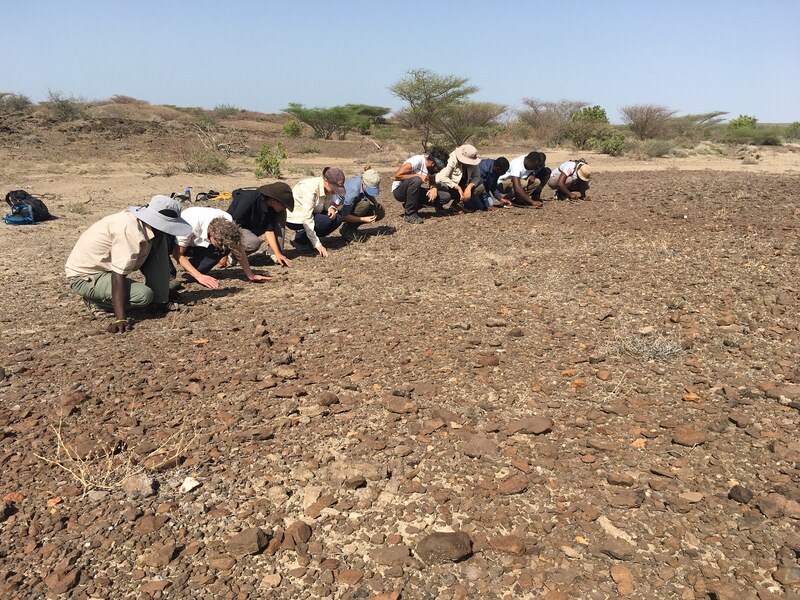 Before heading to Lothagam students practiced measuring and characterizing the stratigraphy of geological formations at a closer site, called Epim, downstream of TBI. 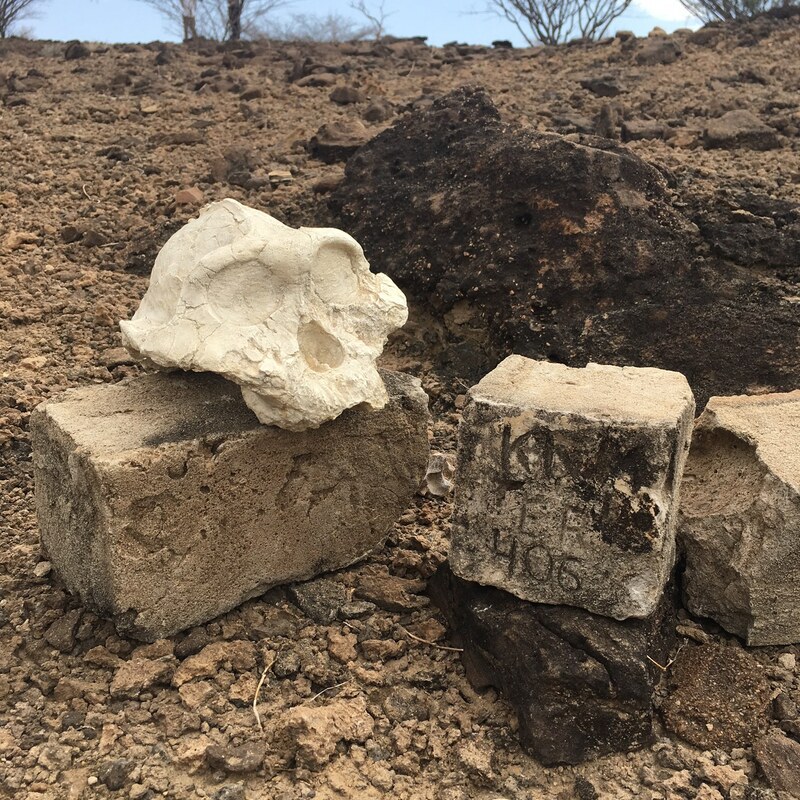 Exposed surfaces of rock or soil hold tremendous amounts of information regarding the environments in which they were created, and their subsequent history under the earth. 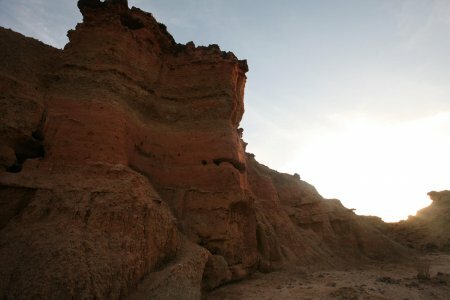 Epim’s sandy soils, shell fragments and occasional silt or mudstone layerings all tell the story of an ancient lake that extended far out into the modern Turkwell RIver during the Holocene, 10,000 years ago. Students set out early to avoid the heat of midday, and set to work after a brief trek to the site. 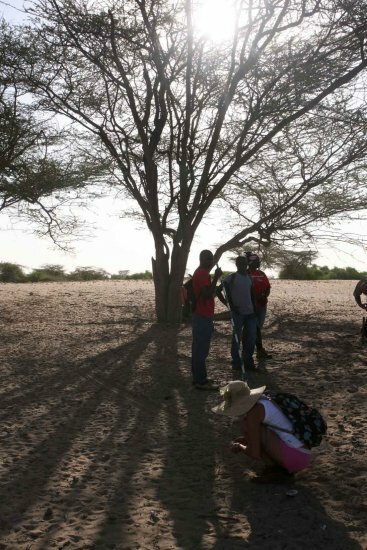 Priscilla kneels to examine bones from a Turkana butchery site outside Epim. Luke tries to limbo underneath a jacobstaff held by Priscilla and Sonia. Luke had never heard of the game, Limbo, but he was surprisingly capable! Our shadows cast across the Epim exposures. The rocks jutting out to the left record the history of a lake that dominated this landscape only 10,000 years ago. 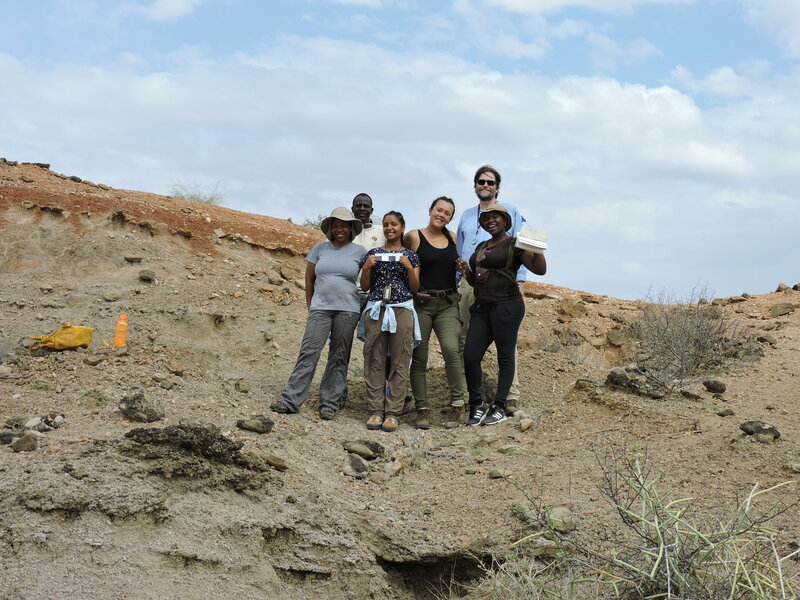 Alisha, Chelsea, Patrich, Luke, Kelly and Alec compare notes on their stratigraphic sections. 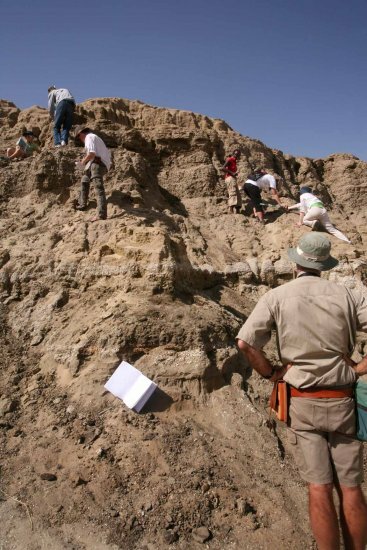 Professor Craig Feibel watches Debbie, Dave, Ben, Mary, Sonia and Kasha scramble up the steep slope as they characterize the stratigraphy of Epim. 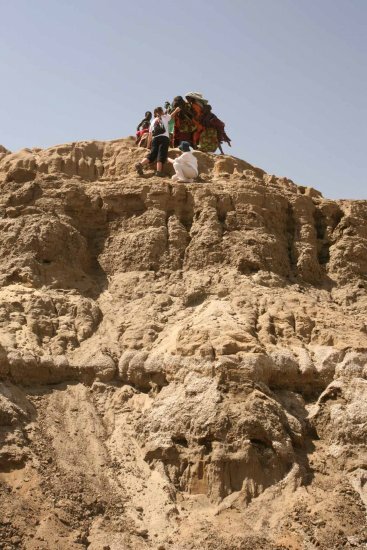 The beds were often steep, and students had to help one another as they climbed the layers to note the history of environmental and geological change recorded within them. A notebook can be seen falling beneath a layer of molluscan packstone in the foreground. Wyatt standing over the Epim exposures. 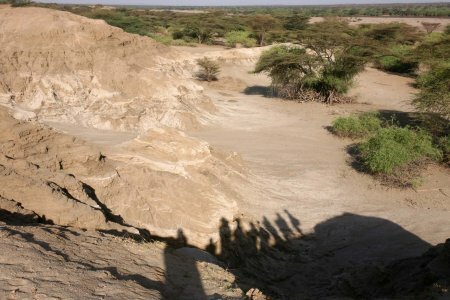 Meadow, Priscilla and Peter look up from lakebed sediments of the Epim exposures. A number of Turkana girls are excited by Sonia and Kasha’s work. The Turkana, who usually traverse the landscape in search of water for themselves or for their flocks, are often interested in our work. Above, you see a group of young women who have come to see what we’re up to. 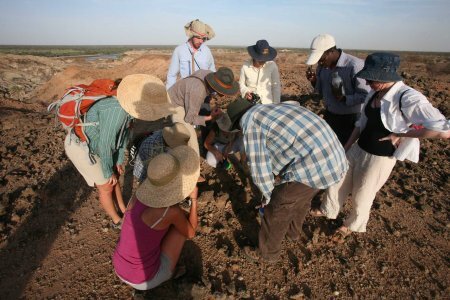 Students gather around a modern burial in the Pliocene beds beyond the Turkana Basin Institute’s grounds. 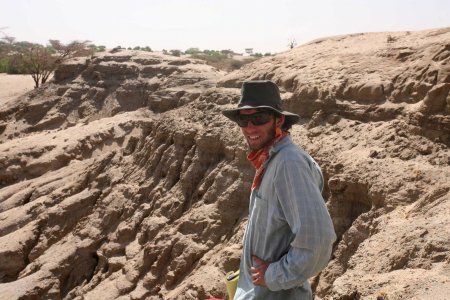 A series of recent burials, a few hundred years old at least, are found atop the Pliocene sediments outside camp. The Turkana have disavowed them, and we do not know to which peoples they originally belonged. The ravines outside TBI bring rainwaters into the Turkwell, and cut sections through Pliocene river and floodplain sediments. TBI is surrounded by a wild and labyrinthine landscape holding a trove of geological and natural history. Students often explore the ravines after class, but are careful to bring navigational equipment and friends along with them. 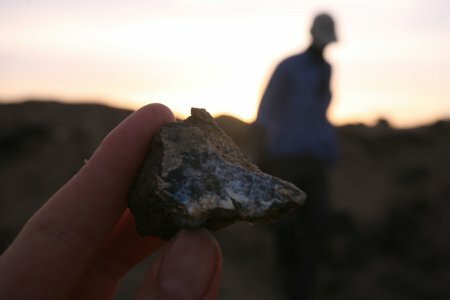 Geology field assistant Joseph stands in the sunset behind a fossil that was buried 3.5 million years ago.